Custom bike shops come and go. It’s more than a slight understatement to say that running one without going crazy, broke, or both is no mean feat. The late nights. The cold winters laying on greasy concrete floors. The striking a balance between art and profit. It’s nothing short of the challenge of a lifetime. And a lifetime is exactly how long it’s been since we last featured the work of Richard Pollock and his Mule Motorcycles shop in California. 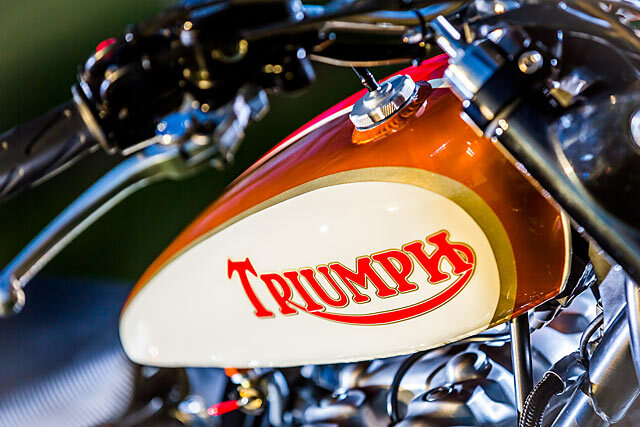 Well, eight years if you must know – but in the custom bike game it’s as good as. And now he’s back – back with bike that makes us wish we’d chased him up a lot sooner. 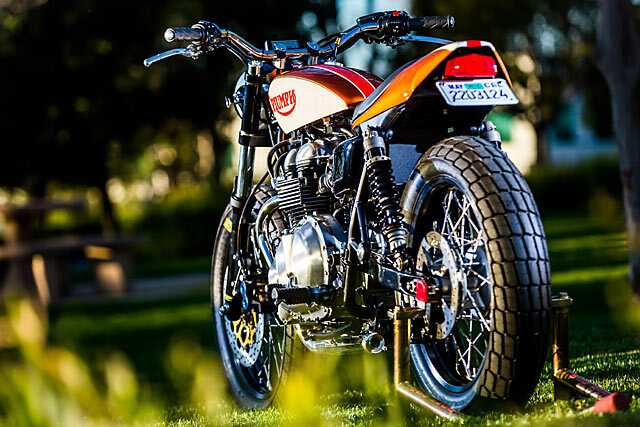 Check out this Triumph Thruxton – it’s his latest, and dare we say greatest build. These upgrades are as plentiful as they are beautiful. 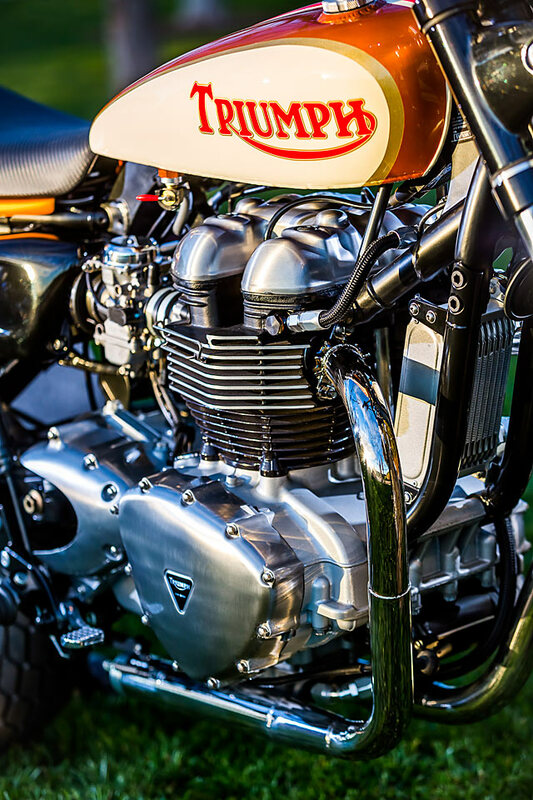 There’s the stainless flat track bars, an oil cooler kit, a sidestand kit, a seat kit, billet triple clamps, Brembo front rotors… the list goes on and on. “On the other hand, the big differences with the bike is that I normally use Yamaha R6 forks, and this uses the stock 41mm Triumph Thruxton units. 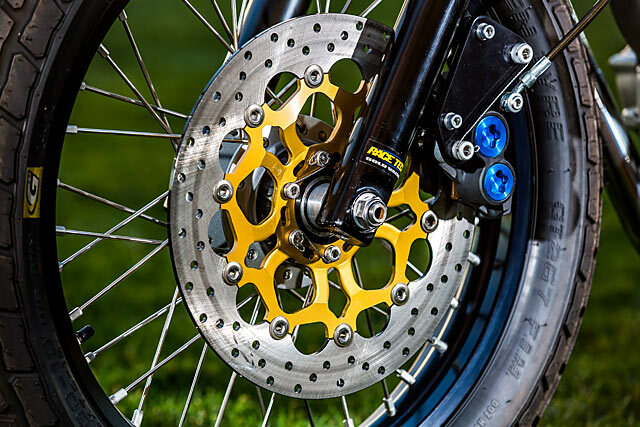 They seem to be the lightest forks available, while not being very high-tech.” But by all accounts, they work just fine on the street, and Rich says they improved greatly after a quick trip to local ‘shock jocks,’ Racetech Suspension in Corona, California. They were fully reworked and equipped with emulators (don’t worry – we had no idea what they were either until we read this) that perfectly compliment the other pair of Racetech shocks out back. 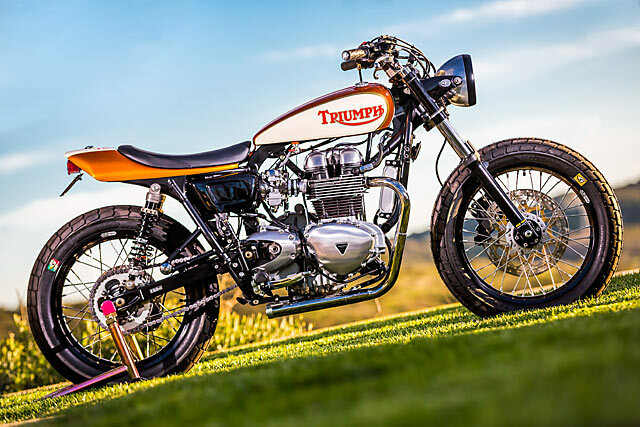 “The 2007 Triumph Thruxton donor bike for the tracker came from a friend who had purchased the bike for a build we had planned,” says Richard. 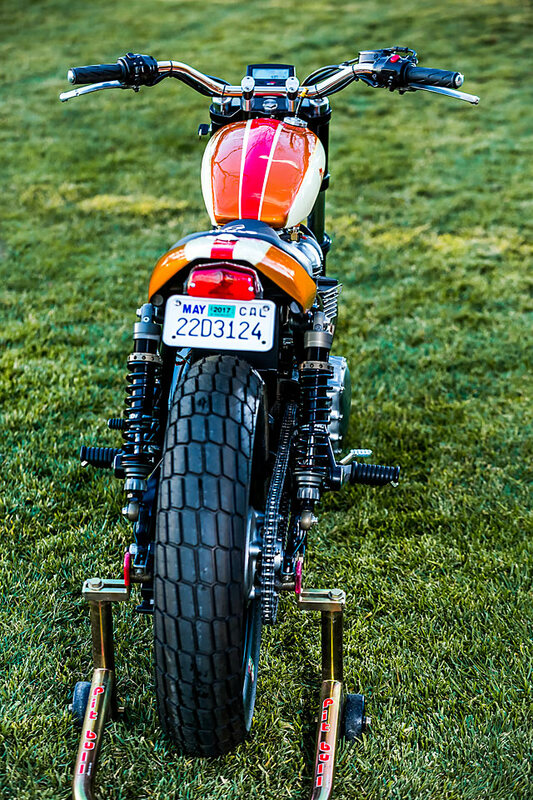 “They ended up buying a bike I had previously built for another customer in Mississippi, leaving this little Thruxton without any love.” He makes it sound like a pound puppy. But it also sounds like the perfect opportunity for a custom build of Great Dane proportions. While it took a decent chunk of time to have the tank built, it’s pretty damn obvious from the shots that the fit and finish were well worth the wait. 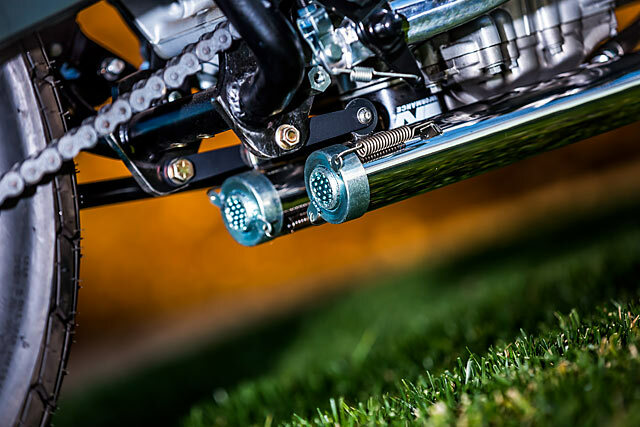 A small Acewell electronic gauge on a custom bracket bolts to the Mule billet triple clamps, letting the rider know exactly how fast he shouldn’t be going. “The 19″ black Sunrims and the stainless spokes were handled by Buchanan Spoke and Wheel, with the Goldentyre brand DT tires coming from Chris Carr at Zanotti Racing provide the grip. Plus, they’re DOT approved,” Rich cheers. 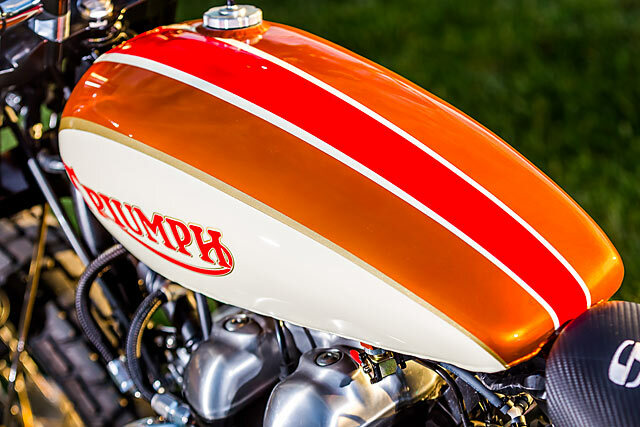 The paint from the Triumph is gold shade from a ‘63 Schwinn StingRay (“My first new bicycle!” says Richard) and it was applied masterfully by David Tovar at Superbike Paint. It’s freaking immaculate, yes? Then stainless tubing was used for the exhaust, transitioning from stock pipeage to a 2″ diameter section with a 12″ long internal baffle to quite the riot a little. “This was to retain the TT pipe’s look while also retaining a driver’s license,” says Rich, with a glint in his eye. “The air cleaners are K&N, and they are matched with the jets delivered in the British Customs’ kit. A Mule oil cooler kit allows the pipes to tuck in uber tight while also eliminating the cosmetic bolt in, under the motor frame rails. 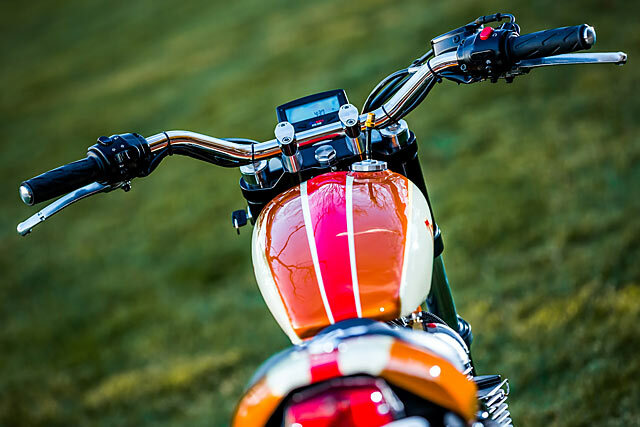 And a Mule sidestand kit in cro-moly holds the bike upright when parked.” For the controls, 1″ bars were used along with stock Triumph Bonneville switches, clutch lever and master cylinder. 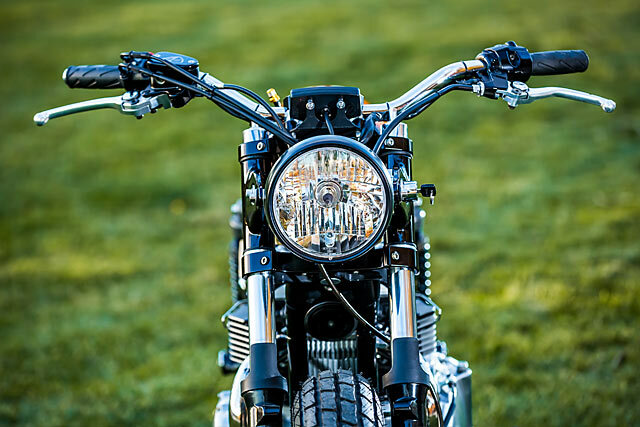 A Crown Performance brakeline passes just behind the LSL headlight unit and modified-but-stock Bonneville headlight brackets. Ironically, that hardest part of the build was also something that Rich outsourced – the paint. “Although I didn’t do the work, this was the fourth attempt at applying this color, having done three other bikes with the same shade. They all came out with the paint beautifully applied, but just a bit too dark – it was almost an orange bronze.” So sure, the paint caused a bit of grief, but in the end it was clearly a home run. Just look at it. And his favourite part? “That’s gotta be the sounds,” Rich exclaims. As you can probably see by the nicely detailed shot above, it’s something he and the Mule team have put lots of thought into. 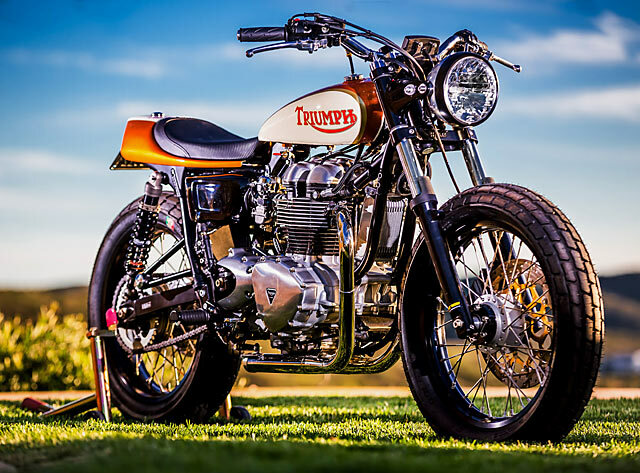 So if this, probably the nicest tracked-out Thruxton we’ve ever laid our rather jaded eyes on, doesn’t impress Mr. 70s Triumph racer, we’re not quite sure what would. But don’t fear, because this bike is one pound puppy that we reckon will never go wanting when it comes to a loving home. Not at all.